This article guides you in how to share files between iPhone and computer. Visit our Droid Transfer page if you need to share files between PC and Android instead. Step 2: Run TouchCopy 16 and connect your Apple device. Step 4: Chose the location you want to add files to, or create a new folder for them using "Create Folder". Step 5: Click "Add file", select the file/files you wish to transfer, then continue. The file will now be copied to your device! This functionality is only available for iOS based devices. e.g. iPod Touch, iPhone or iPad. To view the files and folders on your iOS based device click the "Files" icon in the categories list. You can drag and drop files or folders from your computer into TouchCopy to add those items to your iPhone or iPod Touch. In this way, you can make your iOS device an external storage device, without any hassle! "Create Folder" button - click this to create a new folder or a sub-folder on your iPod. You can also create or delete folders on your iPod by right-clicking the folder. "Add File" button - click this to select the file you wish to copy from your computer to your iPod. Then click on Open in the dialog box and the selected file will be copied to your iPod. "Add Folder" button - click this to select a folder you wish to copy from your computer to your iPod. Then click on OK in the dialog box and the selected folder will be copied to your iPod. Note that you can only view any files or folders that you have added to your iPod Touch or iPhone when your device is connected to your computer. Finally you can delete selected files or folders on your iPod by clicking the "Delete Selection" button. The simplest way to copy the content of the selected folder on your iPod Touch or iPhone to your computer is to click on the "Copy to PC" or the "Copy to Mac" button on your TouchCopy control bar. This will copy the selected files and folders to a location on your PC as given by your TouchCopy options. By default, this is "iPod Content/Files" on your desktop. Alternatively you can select files or folders you wish to copy from your iPod to your PC and click on "Copy Selection to PC" button. Then choose the location on your computer where you wish to save your files and click OK.
Also, double clicking on a file within TouchCopy will allow you to copy that file to your PC having selected the folder you wish to save that file to. Browsing System Files - Or Not. 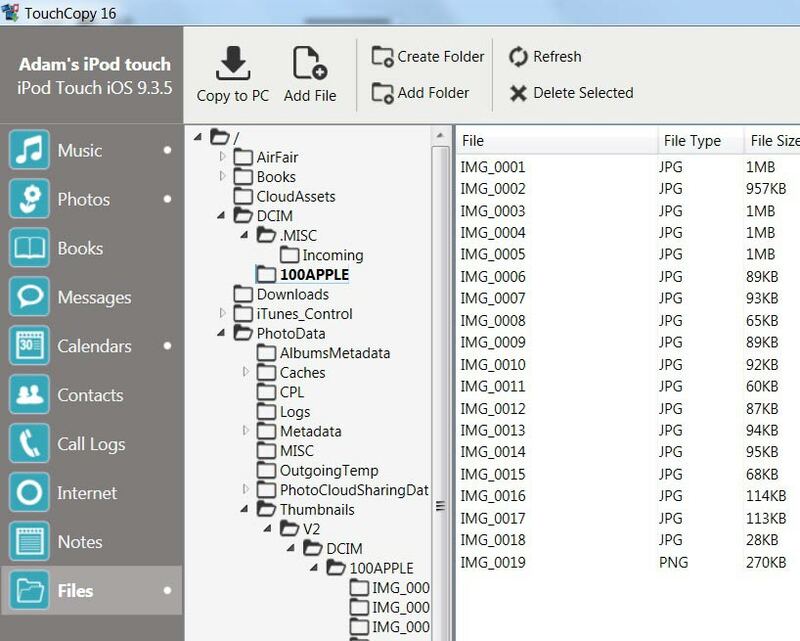 By default, TouchCopy will show you the files and folders that Apple has available on the device's sandbox, such as your iPhone or iPod Touch's media directory. You can browse, copy, add or delete any files or folders in this directory. If your device is Jailbroken, this sandbox is disabled, and you are therefore able to access and modify all your files. Be careful not to delete any system files placed there by iTunes! TouchCopy will warn you if you try to do so.